In what has already been dismissed as a desperate ratings ploy, a Boston radio station plans to give disgraced former Imus sidekick Bernard "Skeletor" McGuirk a tryout next week. 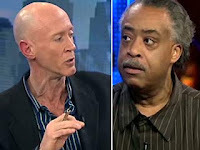 McGuirk (shown right in Hannity & Colmes debate with Rev Sharpton) is the angry racist who actually initiated the now- infamous "nappy- headed hos" controversy that eventually brought down his boss. He'll team up with convicted felon Tom Finneran on WRKO radio's morning show for several days next week. Imus fan and Finneran listener Philip Johnston, former head of the Democratic party in Massachusetts, was surprised to learn that McGuirk would be willing to consider a local show in Boston after so many years with a national audience, but called McGuirk a brilliant radio personality. "Tom Finneran would be lucky to get him," Johnston said. "If he stays within the rules." See all of the latest on this bizarre story at SaveWRKO. HELP us learn more about our readers: take this new blog survey and pick your favorite sites! That would be a great move by WRKO. McGurik is a traditional conservative in the same mold as William F. Buckly, Pat Buchanan, George Will and Joe Scarborough, and for that very reason he will despised by vile neocon garbage like Maloney. Of course with his pseudo shockjock roots he will add levity to the program with his sharp comments about culture and society. I will contacting WRKO personally with my encouragement. Just an Eternian moment, Maloney--there is only ONE PERSON who because of his skeletal frame and evil tendencies as a liberal that gets nicknamed Skeletor--at least by me--AND THAT'S ALAN COLMES! 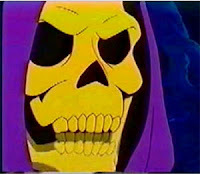 Gosh, I though Michael Chertoff was skeletor. "the black hole of charisma"?? McGuirk is the angry racist who actually initiated the now- infamous "nappy- headed hos" controversy that eventually brought down his boss. So, by your definition, anyone, and I mean ANYONE who does not join in calling Mr. McGuirk a racist is also a racist. Have I got that right? Mr. Maloney, this is your blog, and you are, of course, entitled to your opinion. But I have not witnessed your dislike of anyone more than of Don Imus (et al), and this goes way back, long before April. But now you're simply trying to deprive someone of his career. The man has done more mea culpas than anyone. Let it go. Oh, and I think 'bald headed jerk' fits him most appropriately. Thank you for the information about Bernard McGuirk possibly appearing on WRKO. I too will contact WRKO and encourage them to pursue this course. This is excellent news! I'll be sure to mention your blog. In psycho-con land conservatives are not the "liberals". Imus is a liberal, McGuirk, mmmmmm. Ron paul is a "liberal"
speaking of Ron Paul, notice how the media buried the results of the Republican debate on FOX, Ron Paul won, the media erased the results!!! That should be big news, a long shot candidate won the debate!! Yet, the media made those polls magically vanish. The media is beyond slanted to the right, they are slanted to the fascist wing of the Republican party. The media wants to install Adolf Guiliani at any cost. The MSM is actually campaigning for Rudy G!! !